I had the pleasure of sampling some of Barefoot Bubbly’s Prosecco the other day, and while I’m not one to turn down sparkling wine of any type, I was particularly excited about this one. Barefoot Bubbly is close to my heart: Mr. Geek and I had the pleasure of visiting a tasting room of theirs back when we were engaged, and it’s now the sparkling wine we go for when we’re celebrating anniversaries or special occasions. We’ve gotten the Brut in the past, but I think after this, we’ll be grabbing the Prosecco first. The Prosecco is the perfect thing to sip on a sunny day. It’s crisp, has the perfect tickle of bubbles, and has a not-too-sweet citrus taste. (I sensed a taste of green apple in there, myself.) It would be perfect just by itself, or would complement a fruit-filled brunch or a spicy lunch or dinner. As I sipped it, I pictured myself on a sunny, warm, beach. Waves crashing nearby, sun beating down on me. And maybe it’s because I was currently helping plan a Disney-themed bachelorette party, or because I was already a glass of Prosecco in, but I started thinking about The Little Mermaid, and how this would probably be her drink of choice. (Let’s pretend for a second that she wasn’t 16. Ahem.) I can just see her sipping a glass of this with Eric, reminiscing about the first day she had legs. Barefoot, on the beach. The bubbles in the drink reminding her of the foamy sea. In this mindset, I decided to dress the Prosecco up a bit to be more “Little Mermaid” appropriate. (See picture above!) Your Prosecco ends up looking like the ocean with a sandy beach on top. It’s super easy and adds a dash of pizzazz to your drink! 1. Moisten the rim of a champagne glass with a bit of champagne. 2. Rim the glass with gold glitter crystals. 3. Splash a dash of Blue Curacao into the glass. 4. Fill with Barefoot Bubbly’s Prosecco. 5. Top with a cocktail umbrella. 6. Enjoy while imagining you’re on a beach! Darling, it’s better down where it’s wetter, when the “wetter” is the bottom of the champagne glass! So next time you want to feel like a teenage mer-princess, start sipping that Barefoot Bubbly! Are you a Barefoot Bubbly fan? What’s your fave type? 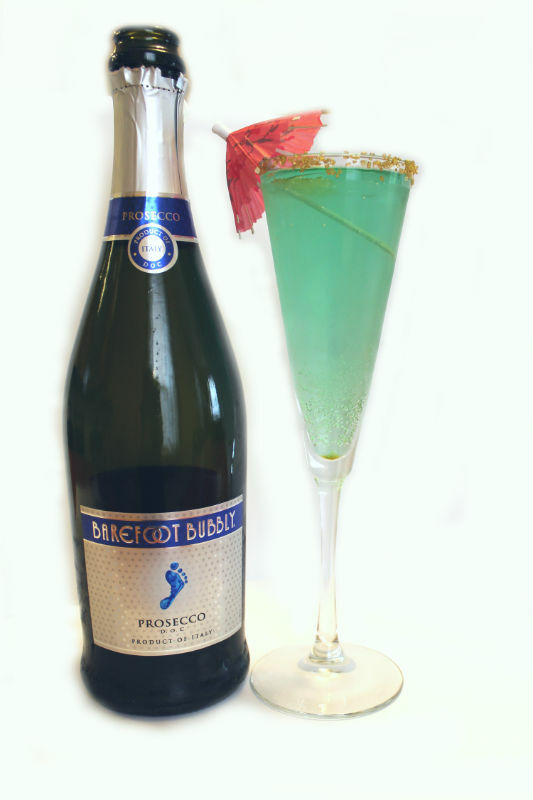 I’ve never tried any of their bubbly drinks, but, Barefoot is a staple wine for us! I’ve got to try this Little Mermaid drink! Sounds summery!